Dunbar and Boardman: What was the biggest challenge with the Sowwah Square project in Abu Dhabi? What was the biggest challenge with the Sowwah Square project in Abu Dhabi? Sowwah Square is the name of a recently constructed district in Abu Dhabi, the capital of the United Arab Emirates. The district is located in the centre of the island Sowwah, northeast of the current city centre of Abu Dhabi. This island is now known as Al Maryah Island. 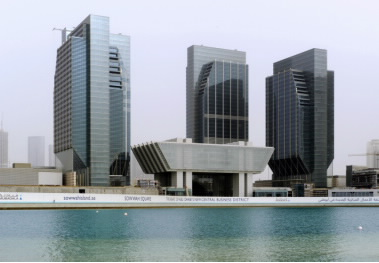 The Sowwah Square project, included four high-rise office towers (150 metres height) and also features the iconic new headquarters building (53 metres height) for the Abu Dhabi Securities Exchange. The High Rise Towers are named Sowwah Square Tower 1, Tower 2, Tower 3 and Tower 4. Now that the area’s development is completed Sowwah Square comprises of 450,000 sqm office, retail and hotel space. Construction for Sowwah Square commenced in the summer of 2007 and completed in 2012. What was the biggest project challenge? When Dunbar and Boardman were commissioned to work on the project by Mubadala – Oger and the architects, Goettsch Partners we identified that the biggest challenge would be to hide the 10 Building Maintenance Units (BMU) necessary for the buildings. This was particularly challenging because of the lower parking area. Additional challenges were presented by the restraint spacing for the towers’ adjustable cradles and the shutter door requirement over the Stock Exchange (low rise) building BMU. The technical solution comprised of ten fixed and movable telescopic roof cars supplied by XSPlatforms, Netherlands. The vertical telescopic machine base (for out-of-sight parking), 30-metre jib outreach, luffable jibs and telescopic cradles make this project special. For the headquarters building, there are two traversing telescopic roof cars with a reach of up to 38 metres. All ten telescopic machines are provided with glass replacement units for lifting weights of up to 650 kg. Also, there are approximately 700 metres of monorail, including self hoisting suspended cradles and special trolleys, turntables to cover the internal side areas and the underside ceiling of the headquarters building. BMU are performing efficiently and contributing to the positive impact the project has had as part of the urban framework plan, entitled Plan Abu Dhabi 2030. Are you currently planning a project that will involve Façade Access and Maintenance? We would be happy to discuss with you. Give us a call on T +44 (0)20 7739 5093 or send us an email via peterboardman@dunbarboardman.com to start the conversation. We look forward to hearing from you.